Entrepreneurship develops around the world in accordance to the different cultural, political, economic and social contexts. Governments promote entrepreneurship as a way to improve economic growth. As capitalism changes, entrepreneurship also changes. This book describes some of the new profiles of entrepreneurs that are creating the entrepreneurial economy of the 21st Century. It presents entrepreneurship in a theoretical and pragmatic way in order to help readers to understand what entrepreneurship means today. Illustrated by socio-economic information and case studies of an international scope, two main questions are explicitly studied in this book: who are the new figures of entrepreneurs and how are they creating the companies of the future? 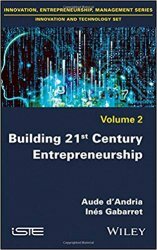 The book is based on academic literature and serves as a reference to researchers interested in the evolution of entrepreneurship.